A 4 mile circular walk. Instructions are given from New Cross Station but New Cross Gate is on the route. Exit the station go left along Amersham Vale. Margaret McMillan Park opened in 1954 and was originally laid out between Watson's Street and Glenville Grove with a series of lawns along Douglas Way where properties had been bombed. In the late 1980s part of park was eroded by housing development. Improvements made in 1998 included a new playground and a sculptural feature in the form of a stone bridge created by John Maine and members of the local community. The former coroner's court and mortuary is now occupied by a music company. Further along is a health centre, a former memorial hall and an Arts & Crafts house (1898). To the left Addey & Stanhope School was built to replace two charity schools in 1899 but since extended. 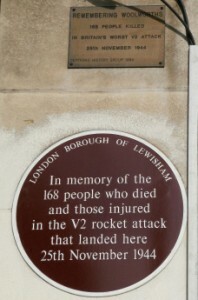 Opposite was the site of the New Cross Empire (1899-1954/8). The Iyengar Yoga Institute occupies the former premises of the New Cross Building Society (re-built interwar). Next door is the Zion Baptist Chapel with a facade of 1876. The engineering works of Clarke, Burnett & Co, employing 100 men, had been sited here 1820-1914. Further along is a view of the former London Board School of 1879, later the SE London Technical School and now the Mornington Centre. Left at Mornington Road and right along New Cross Road. Left at Amersham Road and right along Parkfield Road. Houses here were built in the 1850s. The frontage and side buildings were designed by John Shaw in 1843 to house the Royal Naval School for the sons of 'less affluent naval and marine officers'. This establishment moved to Mottingham in 1889 and the building became the Goldsmiths' Company Institute in 1891. It became part of London University in 1904 and at one time was the largest teachers' training college in Britain. It was repaired after WWII bomb damage and nows offers a variety of courses for all ages. Former Laurie Grove Baths designed by Thomas Dinwiddy which were opened in 1898 and closed in the 1980s. Grade II listed. Ben Pimlott Building designed by Will Alsop and named after a previous warden of the college (pictured in header). Former St James Church (1854) and school (1865) designed by WBL Granville previously used by Laban Dance. A new church was built alongside in 1982. The George Wood Theatre converted in the 1960s from the naval school chapel designed by Shaw in 1853. The rear section of the main (Richard Hoggart) building is named after its architect Sir Reginald Blomfield. It was built in 1907 to house the School of Art. Previously the quadrangle was open to College Green. The Great Hall was originally an open parade ground and was roofed over in the 1890s. Pupils slept in hammocks around the cloisters (now corridors). From the college go northwards along Lewisham Way to the Marquis of Granby. The most notable Marquess of Granby was John Manners (17211770), son of the third Duke. An accomplished soldier and popular figure he aided some old soldiers to set up as publicans. There has been a pub on this site since 1760 but the present building dates to 1868. This was the site of the tollgate 1718-1813, which then moved to New Cross Gate. The (re-sited) column served as a lamp post and ventilation shaft for underground toilets. It was made in 1897 by MacFarlanes of Glasgow to the designs of Alexander Thomson. On the eastern corner is the former New Cross Kinema [more info - scroll down]. Adjoining this is a former Midland Bank of 1905. On the western corner is the elaborate New Cross Inn of 1890. Westwards along New Cross Road. Deptford Town Hall was designed by Lanchester, Stewart & Rickards in 1905 and features marine and naval decorations including a (replica) galleon weathervane on the clocktower. 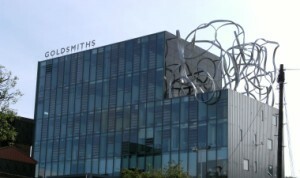 It is now part of Goldsmiths' College. Adjacent is Hope Cottage (1842). The Iceland store occupies the site of the Woolworths where 168 people were killed by a V2 bomb in November 1944 (see plaques). New Cross Gate Station (re-named in 1923) opened in 1839 on the London to Croydon Railway. This replaced and followed the line of the Croydon Canal. The site of railway sheds and workshops is now occupied by a Sainsburys store. Brighton Grove retains a terrace of 1858 built for railway workers. Return to and continue along the main road. Right at Nettleton Road. The corner house has a plaque to Sir Barnes Wallis who developed the Wellington bomber and 'Bouncing Bomb'. This area was developed by the Haberdashers' Company around 1867. Look out for properties with their badge. Left at Hatcham Park Road. Right at New Cross Road. The former New Cross Library of 1911 was the gift of Andrew Carnegie. It was designed by Gerald Warren & Stanley E Castle is now a music studio. All Saints Church by Newman & Billing was built in 1871 and has a fine rose window. The Industrial and Sunday schools were opened in 1877/1882. The corner building at the end was obviously once a shop. Across from this are the remaining buildings of New Cross Hospital (1871-1985). Most of the site has been replaced with housing. Left along Avonley Road and right at New Cross Road. The ambulance station occupies former hospital buildings. Return along New Cross Road, crossing to the other side. Carlton Cottages were built in 1828. Georginia Terrace was constructed in 1827 together with Hatcham Lodge (number 56). This was enlarged in 1858 for George England who founded Hatcham Iron Works in nearby Pomeroy Street. It made over 250 railway locomotives before closing in 1872. The Fire Station opened in 1894 and Hatcham Liberal Club in 1911 (converted to apartments). New Cross Gate was the site of the tollgate 1813-1865. An island site had toilets and another lamp/ventilation shaft. This has been repaired and relocated nearby. The White Hart pub was rebuilt in 1898 and Barclays Bank opened in 1910. Adjoining the pub in New Cross Road was a former early cinema [more info]. The Bus Garage was an LCC tram depot 1906-1952. The Kingdom Hall replaced a Synagogue. Detour into Jerningham Road to view Aske's School. This road was developed in the 1880s. Aske's Haberdashers' School for Girls was designed by Henry Stock in 1891. Notice the gargoyles at the side and the elaborate entrance. The boys' school is in Pepys Road. Return to and continue along New Cross Road. The shop adjacent to the Walpole still has its old trade sign (a tobacco roll). New Cross Station opened in 1850 but the station building was demolished in 1975.